Trinity Candle Factory Premium Scented Georgia Peach Candle - Smelly Jelly - 8 oz. 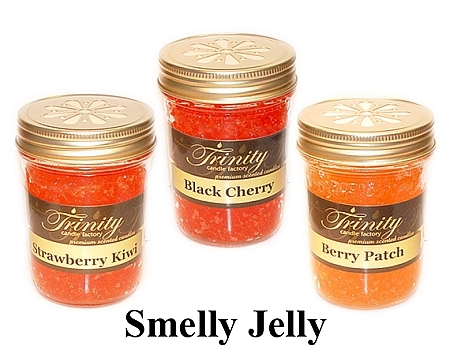 Smelly Jelly comes in all fragrances, premium scented for maximum fragrance throw. With a 100+ hours, Simply take out insert and place in desired location. No Flame Needed. This Georgia Peach fragrance smells just like a fresh peach orchard in your home. This one has a very strong smell of Peach! 100% Satisfaction Guarantee. Georgia Peach - Reed Diffuser Oil - Refill - 8 oz. I recently received an order for 3 of the Georgia Peach, Smelly Jelly, 8 oz and really do like them. The Smelly jellies are just so nice as I don't have to mess with a candle and the fragrance is my favorite. Really am pleased with them.